Be like the pros. Create an amazing hollywood-like spectacular exposion with the help of this tutorial. 1. Start off with a new image of your size with a black backgound. Create a new layer (we’re only going to use one layer in this tutorial so don’t care to call it something). Create dots with the airbrush, use a 100px brush. 2. Now do some work with the smudge tool. Drag the smudge tool from out to in and in to out to get a nice effect. Work on it to make it look nice, yet random. 3. Now here comes the part where all the noobies fall off. This might take time. Start off by using different brushes (I used photoshop brushes only..!) and make effects. 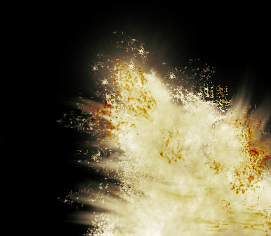 Use the grungy brushes and make sparkles coming out of the explosion. Do some more smudging, add more brushing and vola! Now go over your white boring explosion and brush… Release your mouse button and brush over it to create some dark parts and some lighter. Make it cool, yet random. Vary the brush size for better results! 6. Duplicate that layer you just made, and set it to Color Burn. Now go image – adjustments – hue/saturation and give it a nice, warm, red color. This will add depth and some realistic effect to it. 7. Now you’re done. This effect works wonderfully in abstracts.